When Charles Soule took over DC Comics’ Swamp Thing in April of 2013, he had a few creator-owned projects to his name. Just short of two years later, Soule is now one of the busiest writers in superhero comics, spearheading major Marvel titles like The Death Of Wolverine and Inhuman, and delivering one of Marvel’s best runs in recent memory with his She-Hulk series. Currently a Marvel exclusive creator, Soule pens his final DC story with this week’s Swamp Thing #40, an issue that spotlights why Soule’s profile has risen so quickly in the industry. The conclusion of an epic 26-issue run (including Villains Month and Futures End issues plus two annuals) that significantly expanded the world of the title character, #40 is both a fantasy war story and a meditation on the nature of art, offering widescreen action and complex metafictional ideas as Swamp Thing puts an end to the Machine Queen’s reign of terror. Soule’s Swamp Thing is easily one of the standout runs of DC’s New 52, intricately plotted and populated with memorable characters that have each gotten moments to shine. Soule has also been gifted with an outstanding lineup of artists, beginning with contributions from Kano and David Lapham before settling on the regular rotating art team of Jesus Saiz and Javi Pina. It’s been a remarkably consistent title, with an intense, captivating story and lush visuals that realized Swamp Thing’s experience in meticulous detail, and the finale continues this trend while introducing a big twist for the lead character. “This is a story,” a mysterious narrator says at the start of Swamp Thing #40, “and so, eventually, there will be a final page. For most people, that’s where the whole thing lives and dies.” From the beginning, Soule establishes that this isn’t going to be a conventional superhero series conclusion where the good guys beat the bad guys (even though that does indeed happen). Swamp Thing has never been conventional, and after Alan Moore’s legendary run, he became synonymous with experimental comic-book storytelling. He’s a character that exists at the intersection of multiple genres with a power set that makes it possible for writers and artists to do basically anything they want with the character, and Soule has taken advantage of that creative freedom to build a sprawling story that pulls from different corners of the DC Universe but reads unlike anything else the publisher puts out. Familiar DC characters like Superman, the Scarecrow, John Constantine, Vandal Savage, and Etrigan The Demon all made their way into the title, but the guest stars never distracted from Alec Holland and his new supporting cast. Soule’s primary focus has always been on character and getting into Swamp Thing’s head, highlighting the internal struggle between Holland’s humanity and his obligations as the Avatar Of The Green. The secondary focus was on expansion, and Soule developed ideas that could fuel years of future Swamp Thing stories, delving into the history of the Green’s various Avatars and introducing new systems to go along with the Green (plants), the Red (animals), and the Rot (decay). First came the Mycos, the network that connects all fungal life, followed by the Rithm (formerly the Calculus), which connects all machinery. It’s not unlike the work Geoff Johns did with the different Lantern Corps during his Green Lantern run, taking established mythology and using it as a springboard for new concepts that open a lot of future storytelling possibilities. At the root of these systems are three core elements: reproduction, evolution, and death. For this final issue’s big twist, Soule introduces one last system, but it’s more abstract than the others. 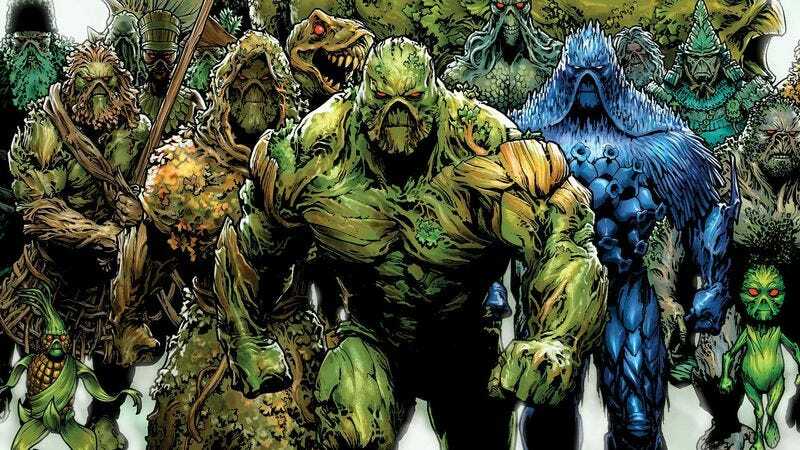 In the middle of the devastating battle with the combined forces of the Rithm, the Mycos, and the Rot, Swamp Thing looks for a place to hide while stalling his enemies, fleeing into the pages of a book, because paper is part of the plant kingdom. Once inside the book, he finds himself at the central hub of yet another system, one representing art in all its myriad forms, from writing to painting, music, film, and theater. The Avatar of this unnamed network (the aforementioned mysterious narrator) explains how art reproduces in the mind of the consumer, evolves through different interpretations, and dies if the work doesn’t get enough attention, a fine example of Soule’s outside-the-box thinking on this title. Swamp Thing’s exceedingly creative use of his powers put him on the art Avatar’s radar, and he’s offered the chance to leave his old life behind to join this new realm where his only responsibilities are discussing art and inspiring others. It’s a clever way of paying tribute to the legacy of creators that have worked on the character, looking at Swamp Thing as a force that sparks the imaginations of those that come in contact with it. The art Avatar material does come out of nowhere in the midst of a raging war, but it’s still very effective, significantly changing the context of the story in its final moments. It’s no longer about all these different fantastic characters battling for the future of the world, but about one man’s choice to keep fighting or trade his responsibility for a peaceful life. This is still a superhero comic, so the outcome of this issue’s clash between good and evil was always going to end in Swamp Thing’s favor. There’s no way that DC would have a major line-wide status quo change in the pages of this title, especially with a major line-wide status quo shift in the works with next month’s “Convergence” event. The Machine Queen’s campaign was doomed to fail, and Soule makes a wise choice in pulling away from the fight to add more complexity to his run’s conclusion. The action is especially engaging because Saiz’s Avatar designs are so cool, interpreting Swamp Thing’s look for different types of creatures and a variety of human occupations. The cover art spotlights his striking design sense (with an appearance by Ryan Browne’s adorable popcorn Swamp Thing), and also shows the impressive work Soule has done delving into the history of the Avatars. From a number of dinosaur Avatars to Avatars based on samurai, Nubian princesses, pirates, and Native Americans, Saiz has designed some beautiful new takes on the classic Swamp Thing design, and this final issues spotlights his talent by putting these characters in the final fight. Losing colorist Matthew Wilson could have been a major blow to this book’s art, but DC found great replacements with Matt Hollingsworth and June Chung. For this final arc, Chung has had to transition from the sleek metallics of the Rithm to the richer, more organic color palette of the Green, and she’s done strong work differentiating these two systems, using a more painterly style for the organic elements that gives them a life that isn’t found in the cold tones for the machines. Chung brings a lot of texture to the linework for this issue’s opening scenes in the Green, then switches to a smoother rendering style for the Rithm before finding a middle ground when the forces collide in battle. The realm of the art system is devoid of color except for the swirling hues on the bodies of its Avatars; the completely white background calls to mind a blank sheet of paper, an empty canvas that only gets color when an artist is creating. The creative team is rounding out by Travis Lanham on letters, and he’s done brilliant work on this book assigning distinctive fonts and balloon shapes to reflect the individual voices of characters. Swamp Thing’s word balloons are a deep orange with angular edges, suggesting both warmth and roughness. The Machine Queen’s word balloons are jagged and surrounded by the thick blue line, almost as if the words are freezing as they come out of her mouth. And the art Avatar’s text is a clean, refined cursive on a plain background to create the illusion of someone writing on a piece of paper. The specificity of the lettering is indicative of the specificity in every aspect of Soule’s run on Swamp Thing, and that attention to detail made it one of DC’s best ongoing series (and one of The A.V. Club’s best comics of the last two years). As the narrator mentioned at the beginning of Swamp Thing #40, a story can live or die by the strength of its ending, and the final page of this issue concludes the series in a way that keeps it alive after the book is closed. Sitting in his swamp home with his lover Abby and friend Guarav, the lead hero reads Gabriel Garcia Marquez’s 100 Years Of Solitude and considers the art Avatar’s offer, holding his hand over the book’s pages. The story ends with a close-up of Swamp Thing’s face, leaving the reader wondering whether he accepts the invitation, and with no information regarding the character’s post-“Convergence” status quo (there’s no Swamp Thing series in the works at the moment), it’s a finale that allows the audience to finish the story. And ultimately that’s what this run was all about: creating a story that grows and evolves and dies, but establishes roots in the reader’s mind that guarantee its impact will still be felt once the series ends.